Submitted by Edward Revy on October 4, 2008 - 08:30. A truly great work has been done by Myronn, the author of the current Trend Line Trading Strategy. Support-resistance trading, trend line trading, checking higher time frames, money management — the strategy has a concrete-like theory base and a simple implementation — a winning combination, that places it into the category of advanced strategies. Remember, your feedback, comments and suggestions are always in great demand! Submitted by Grant on November 17, 2008 - 18:13. Also, I have been busy doing something I have never done successfully before, which is what I call scalping. Attached is the 5M chart of EUR for today Nov 17. I noticed one night sitting with my laptop in front of the TV (Tokyo session) that even though I thought JPY was choppy, that the 5M showed what I call ladders, of retrace and extension and it was very orderly. If you bought at the trendline there was very little in the way of Neg Excursion. I don't like JPY, so I went to look at others to see if it was just JPY or others too. So here is the Euro. I trade with the latest 5M trend and let it start to retrace before I exit, the reason being it may break out. I missed the L break at 18:45 but not the one this afternoon (don't let the times confuse you, it's the server time, not mine). That was just luck though. I exited on the big red down candle and the very next one went back up so I entered S again. Seeing as how I was still in profit I let it go cuz I thought what the heck, it's w/ the trend and is going back down again. Also it's w/ the big trend . .. .
of course, I wish i had let it go, but when it started going up I exited it, w/ about 40 pts. In the future I think I will trade this TF more often. The lower 'ladder had swings of 35 pts, the upper 20 -25.. Count the number of trades here just today. Usually I don't trade mondays, but I'm glad I did today. Submitted by Grant on November 16, 2008 - 11:26. Don't take it personally Myronn, but I have been busy trading the opposite than you. Ha ha. www dot learncurrencytrading (dot)com/fxforum/trend-line-trading. It's the dailyfx dot com forum. I am Blizzard. There have been a few big trendline breaks lately. The thing i like about your strat is that either you are right or wrong, no middle ground. Either it breaks and you reverse or it holds. Either way, it's like a line in the sand. Keep up the good work Myronn. Submitted by Burt on November 15, 2008 - 21:24. Could you update us on this weeks performance? How much have you been able to make? Submitted by User on November 13, 2008 - 21:46. U can find the zigzag indicator on IG market by clicking on TOOL, select the option for REAL-TIME CHARTS, when the charts open select INDICATOR/BACKTEST on the chart menu which then brings up a list of indicators, the zigzag ind. is right at the bottom of the list. Submitted by debono on November 13, 2008 - 20:56.
was already using it for major trends. didn't even look to see if there was a variation adjustment. Submitted by User on November 12, 2008 - 21:48.
to the block from wa there is a zigzag indicator on IG markets in the advanced charts. Cheers Myronn you're padding my wallet too. Submitted by IVYXXX on November 12, 2008 - 14:27.
i am really grateful for the quality strategies that abounds in this site. this one by Myronn particularly excites me and gives me great confidence when taking a position ....i must admit however that i am struggling with calculating lot size(with respect to my mm rules) each time i have to place a trade...can anyone help? Thank you Myronn, Edward - you're great, and to Grant - ur contributions has really helped me. thanks to you all. Submitted by Myronn on November 12, 2008 - 13:58.
with regard to your question Joe, yes, I opened a 5k account for standard lots. The number of lots/lot sizes I trade depends on my risk % that I use that is 5%. Submitted by debono on November 12, 2008 - 06:40. Every trading book I have read tells you to let profits run and I have to admit that when taking set pip profits I tripled my account in 2 weeks of careful trading. Then greed also got me...let the profits run they cry...oops. I was simply trading support/resistance and triangle breaks. New it was too easy to be true. Still not bad but not enough rules in my strategy to protect profits. I use IG here and they do not have the swing zz indicator...do you know if this can be applied? I have tried to download links from yours and Edwards posts but to no avail. Submitted by joegathu on November 12, 2008 - 05:54.
you said you started off with a 5000$ a/c. i would like to know if you opened a mini a/c of lots 10K, or a standard a/c of lots 100K. am asking because your results got me wondering.....15K dollars in a month or so? anyway, if it is a mini a/c, how many lots do you buy or sell in your trades? Submitted by Myronn on November 12, 2008 - 04:33. (1) understanding the concept of a trend: uptrend=higher swing highs & higher swing lows & downtrend=lower sing highs & lower swing lows makes it easier to draw a trendline. all you do is connecting significant swing highs/lows. (2) when a tredline is broken significantly, the may signify a change in trend OR just another swing high/low formed but will head back in the previous direction. since that trendline is violated, you need to adjust your trendline to what "new" info you have now. (3)If you have read, Grant's explanation previously about FRACTALS, this is the same thing here:minor trends within the main trend. what you see in the smaller timeframe is a minature representation in the larger timeframes. Yes, I do trade in the minor trends within the 1hr. I use 30& 15min minor trends & for entry, I swith to 5min TF. (4) When a triangle formation is happening, that is two trendlines convergin together, I place trade in the direction of the MAIN TREND because I have observed that is what seems to happen most of the time. but if I am unsure of what direction, I stay out. (5)You can enter at point 3, and any other swing highs/lows that form after point 3. But If you really want to ensure confidence in you entry at these points, it would really pay to have some good understanding of candlestick formations as well as a good understanding of the major fib levels. Yes, the market will go wherever it pleases and sooner or later the trendline will be broken after being "tested" many times in the past. Submitted by Cody on November 11, 2008 - 01:15. Thank for your sharing. I find that it's not easy to drawing good trendline sometimes. Any rule should we need to follow?? 1. How could we draw a valid and accurate trendline? 2. 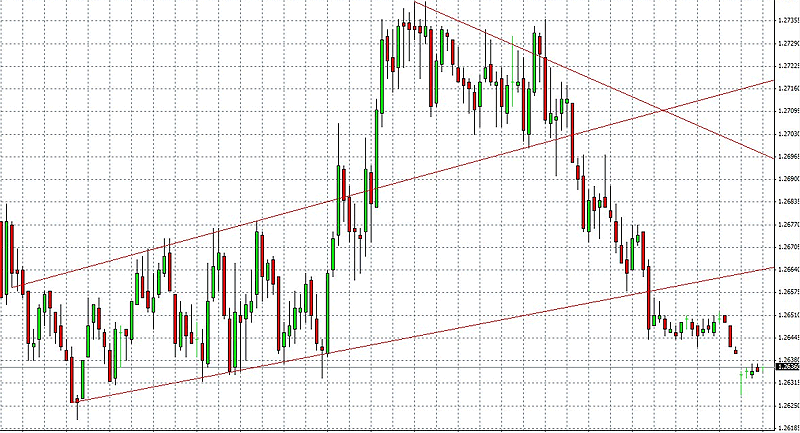 When should we adjust the trendline if price breakout the trendline? 3. Sometimes, there may exist main trendline and minor trendline in 1 hour graph, will you trade in minor trendline? 4. Sometimes, there may have upward and downward trendline at the same time (say triangle pattern), how to determine long or short? 5. In general, should we always waiting point 3 to entry? I found that the probability that trend will be reversed if more points touch the trendline. Is it true? Submitted by Myronn on November 8, 2008 - 15:02.
good to hear what you have done. Keep it up. Submitted by Myronn on November 7, 2008 - 21:42. I have attached 2 charts showing a little tip on trade entry that I use. The first chart shows entry in the 1hr timeframe (TF) and that would have provided only 2 valid short entries at point 3 & 4. The second chart shows the same pair in 15min TF and that shows 3 valid short entries at (3), 3, 4. See charts for details. Submitted by Cody on November 7, 2008 - 21:26. Thanks a million. Yesterday, I tried to use this strategy in smaller timeframe to earn 30+ pips on 1 min chart in my real account, which based on 5 min to look at the trend, 4 wins out of 5 trades within 3 hours. This is a great system to catch up opportunity for "buy low sell high" and obey fundamental rule "trend is your friend". One key point: For short strategy, I prefer to set a trailing stop few pips about lower high if price is favour to my entry point, vice versa for long. This is a more conservative and safty to improve your winning rate. In real trade, I think winning confidence is more important than money.